Last time, I looked at how trade policy helped the avocado become one of the hottest fruits in the produce section. One problem with the surging demand for avocados in recent years is that they’re not exactly easy to harvest. Every single avocado has to be picked off of a tree by hand. Tree-shaking machines, like those used for harvesting almonds and cherries, don’t work for avocados because even on the same tree, avocados mature at different rates. Another reason why mechanical picking isn’t an option has to do with basic physics – unlike almonds or cherries, avocados are fairly substantial. When a heavy fruit drops 15 to 30 feet – the height of most avocado trees – it will bruise, which is great for guacamole but not for getting avocados to the market unscathed. 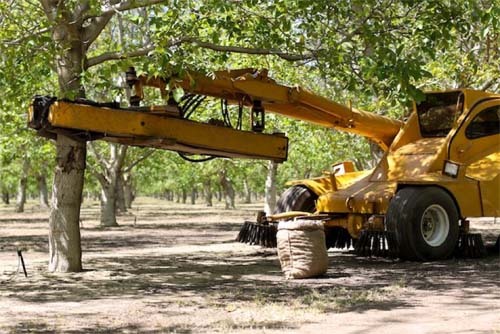 A tree-shaking machine: Good for nuts, not for avocados. Increased demand, combined with the labor-intensive nature of avocado harvesting, can make it difficult for producers to find enough people to bring their crop in. 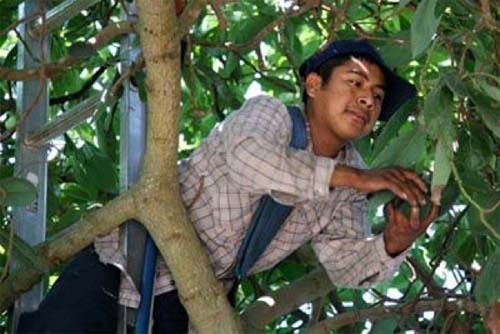 According to a 2017 survey from the California Farm Bureau, 69 percent of growers with seasonal workforces have reported employee shortages, with the shortages being most acute for tree fruits (like avocados). Growers also said that the overall skill level of their workforce has become an issue, resulting in increased harvesting time and, in some instances, crops not being fully harvested. Nearly half of the growers surveyed said they’ve been offering higher wages, benefits, or other incentives in an attempt to attract a better skilled, more motivated workforce. The workforce that harvests avocados, along with every other seasonal crop, is overwhelmingly immigrant-based. According the Department of Labor, 80 percent of hired farm workers are Hispanic and only 31 percent are U.S. citizens. Mexico is far and away the main supplier of immigrant labor – 68 percent of all hired farm workers in the U.S. were born in Mexico. Only 21 percent are permanent legal residents, and just 53 percent have work authorization. In other words, nearly half of the entire agricultural workforce is made up of undocumented immigrants. Some people don’t buy this, arguing that when the economy gets bad and there are few jobs to be found, American citizens will gladly take agricultural jobs. The problem, the argument goes, is that all the immigrant labor locks U.S. workers out of the farm labor market. The most common type of work permit for seasonal farm laborers is an H-2A visa, with over 134,000 issued in 2016. The H-2A program was created in 1986 as a way for businesses to temporarily bring in immigrant agricultural labor for the season. Businesses that want to employ H-2A visa workers first have to demonstrate that they’ve repeatedly tried and failed to attract full-time legal U.S. residents for the jobs they’re hoping to fill. If they can do that (and it’s generally not too hard), they have to deal with multiple state and federal agencies as well as the U.S. embassy of the immigrant employees. Employers also have to find the workers, arrange for their transportation to and from their home country, provide them with meals and housing, and ensure they have a way to get back and forth to work. So many businesses have struggled with navigating this process that a cottage industry of H-2A visa advisors has sprung up. When I talked with one of these advisors, I asked her if the byzantine and confusing nature of the process might push producers – especially smaller producers – into hiring undocumented workers. “I think that happens all the time,” she said. “That’s what the majority of employers are doing.” In addition, she pointed out that businesses that try to do the right thing and go through the H-2A program open themselves up to Department of Labor investigations. Ironically, farms hiring undocumented laborers are often more insulated from investigation, because they fly under the radar with no employment paper trail on file with the federal government. A workforce made up largely of immigrants, most of whom are poorly educated with little to no English language skills, is a workforce tailor-made for exploitation. Undocumented workers seldom speak out due to fears of deportation, and even those with H-2A visas are at risk, because their residency in the United States is tied to their employer – if they’re fired, they can’t look for another job – they’re sent home (or they remain in the country illegally). Several independent investigations have found rampant exploitation of immigrant farm workers. Common abuses include withholding pay, not paying overtime, intentionally under-recording time worked, confiscation of worker visas, prohibiting workers from leaving the farm, and even widespread intimidation, harassment, and sexual abuse. The federal government has investigated too. In 2015 the Government Accountability Office (GAO) reported that from 2009 – 2013, 866 H-2A visa employers were in violation of one or more legally mandated worker protections, the vast majority of which related to worker pay. The report also found that violations may be under-reported because workers fear retaliation, deportation, and blacklisting. Technically, businesses that violate immigrant farm worker rights can be banned from the H-2A visa program for a period of time. But in reality this rarely happens because the statute of limitations is only two years. That’s not two years from the time between an alleged violation and when a complaint is filed, but two years between the violation and the conclusion of a Department of Labor investigation. According to the GAO, the median length of investigations conducted from 2009 – 2014 was 24 months. In other words, half of all investigations went on longer than the statute of limitations, meaning that even if violations were found, violators couldn’t be banned from the program. Even if a business is debarred from the H-2A visa program, that doesn’t necessarily stop them from bringing in immigrant workers. Debarred businesses can simply make small changes to their name and reapply. You might think that this wouldn’t work, because after all, you can change the name of your farm but you can’t just move it down the road. The problem is that while the Department of Labor does check new H-2A visa applications against a ‘debarred list’, the automatic check only includes business names, not addresses. If employment of undocumented workers is rampant in agriculture, why hasn’t the government cracked down? One reason is that it can be difficult to prove that an employer knowingly hired an undocumented worker. Employers are required to ‘check papers’, but thanks to a thriving fake immigration document business, that’s not much of a barrier. Of course the employers know that many of these documents are bogus, but it’s in their economic interest to not look too closely. All employers have access to a federal system called E-Verify, which allows them to check job applicant documents against government records. But, two decades after its release, E-Verify remains voluntary in 41 states. And in the nine states that do mandate it, enforcement ranges from spotty to nearly nonexistent. President Trump has called on Congress to make E-Verify mandatory nationwide, and there was initially talk of including a mandatory E-Verify provision in legislation intended to replace President Obama’s executive order on Deferred Action for Childhood Arrivals (DACA). But as of late October, Senate negotiators ruled out making E-Verify mandatory. While there’s some Congressional support for mandatory E-Verify, there’s also bipartisan opposition. Many groups on the left voice concerns about privacy and data errors, while some on the right view E-Verify as a further intrusion ‘Big Brother’ federal government on businesses. And then there’s the elephant in the room: Underpaid, exploited immigrant workers keep costs way down. The federal government could absolutely enact immigrant labor reform that would crack down on hiring of undocumented workers and dramatically improve the lives of agricultural workers in the country legally. But providing workers with decent wages and working conditions would impose major costs on businesses, who would of course pass most of those costs along to American consumers. Sure, Americans say they care about immigrant labor abuse (at least, most Americans do), but do they care enough to pay $3 for an avocado? “Results of Ag Labor Survey Released | California Avocado Commission,” accessed October 31, 2017, http://www.californiaavocadogrowers.com/articles/results-ag-labor-survey-released. United States Department of Labor, “Findings from the National Agricultural Workers Survey (NAWS) 2013-2014,” accessed October 31, 2017, https://www.doleta.gov/naws/pages/research/docs/NAWS_Research_Report_12.pdf. “California’s Undocumented Workers Help the Economy Grow – but May Pay the Cost,” Public Radio International, accessed October 31, 2017, https://www.pri.org/stories/2017-03-06/californias-undocumented-workers-help-grow-economy-theres-cost. Michael A. Clemens, “International Harvest: A Case Study of How Foreign Workers Help American Farms Grow Crops – and the Economy,” 2013. “Unable to Fill Jobs, Companies Look to Foreign Visa Workers to Fill Void,” The North Bay Business Journal, July 10, 2017, http://www.northbaybusinessjournal.com/northbay/sonomacounty/7184851-181/visa-h2a-wine-labor-tigh. name withheld, Personal interview with H-2A Visa Advisor (name withheld at request of interviewee), November 2, 2017. U.S. Government Accountability Office, “H-2A and H-2B Visa Programs: Increased Protections Needed for Foreign Workers [Reissued on May 30, 2017],” no. GAO-15-154 (May 30, 2017), https://www.gao.gov/products/GAO-15-154. Previous Previous post: How Safe Is Your Food?